DAVINCI development A/S has entered Danish motorsport, where we have entered into collaboration with the Danish Thundersport Championship, for the development of bodywork for the motorsport series, based on high-end sports coupes. The development is centered around an Audi RS5 and a Mercedes AMG C63. A Chevrolet Camaro, which is one of the current DTC racers, is used as a reference. After the bodyworks are modeled in CAD software, they are used for CFD calculations. The race organizers want to make sure that using a specific bodywork can’t be an advantage for the teams. 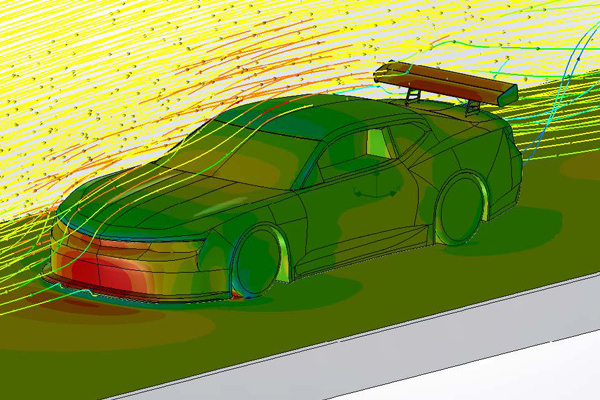 To ensure this, the Camaro, Audi and Mercedes are subjected to CFD analysis. CFD stands for Computational Fluid Dynamics, which is a general term for software that can simulate the flow of gases or fluids through a tube or around an object. Air is a combination of different gases and vapors, which is well-defined in most CFD software. 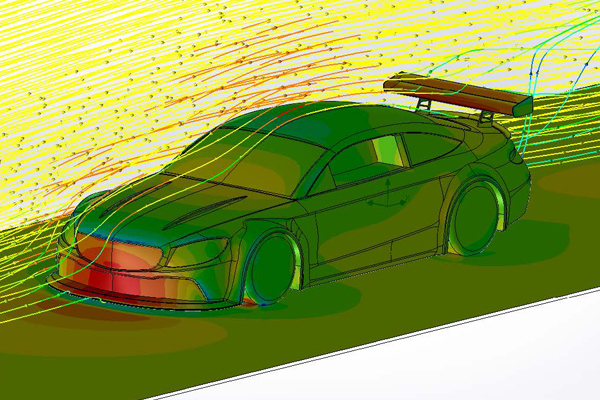 It is therefore possible for us, via CFD software, to simulate all thinkable situations, where we are interested in airflow and its influence on the car. In short, the purpose of the aerodynamic simulations is to streamline the bodyworks’ aerodynamic characteristics at 100 km/h and 190 km/h, respectively. The aerodynamics at 100 km/h is chosen, as it is the most typical speed when coming out of a turn, while the aerodynamics at 190 km/h is examined, as it is the top speed on the fastest track in Denmark. By carrying out CFD analyses and via iterative changes to the geometry, we can ensure that the difference between the bodyworks’ aerodynamic characteristics are so insignificant, that the drivers will not be able to feel any difference. Firstly, a CFD analysis is carried out on the Chevrolet Camaro, which is one of the current DTC racers. Data on the drag- and downforce, as well as the distribution on the front and rear axles is noted, and is used as a reference for the analyses on the Audi RS5 and the Mercedes AMG C63. The reason for this is that the Camaro’s geometry is already locked, and it is therefore only possible to adjust the Audi and the Mercedes. 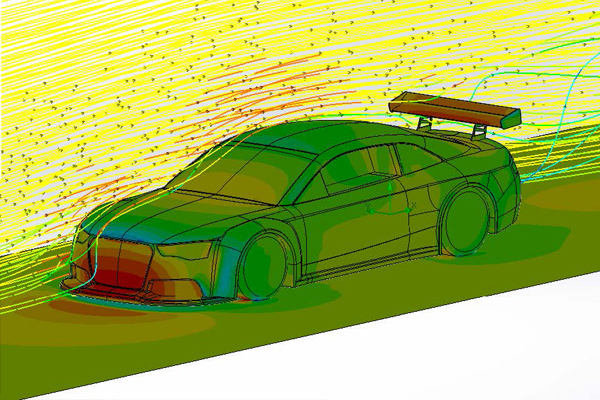 Afterwards, a CFD analysis on the Audi is carried out, where data on the drag- and downforce, as well as the distribution on the front and rear axles is noted. The results are evaluated, and changes to the geometry are suggested to the designers, to get results that are closer to the Camaro’s. Hereafter, a new simulation is carried out, were the same data is noted down. This approach is repeated until the results are satisfactory. The results are evaluated in collaboration with representatives from DTC, where the design is eventually locked. A similar analysis is carried out with the Mercedes, so the cars’ aerodynamic features are close to identical. 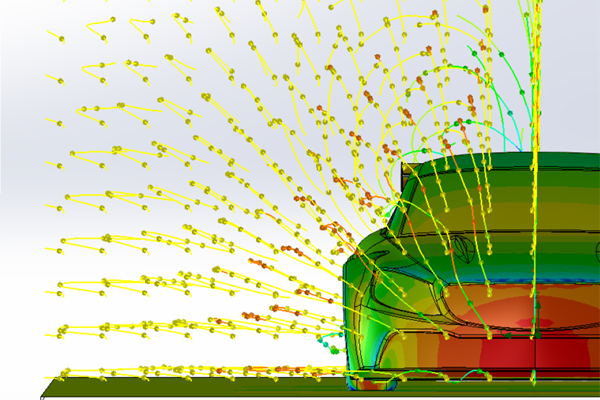 The CFD analyses are not full-detail simulations of reality, as the cars drive with the windows down, and have holes for cooling in the front. These details have not been modeled correctly, to keep the level of detail at a level, where the collaboration with the designers is effective, while the results are sufficiently accurate. The solution was to apply the same assumptions to each of the 3 cars, so it would only be a comparison of the results of the 3 cars, and not necessarily an exact simulation of reality. 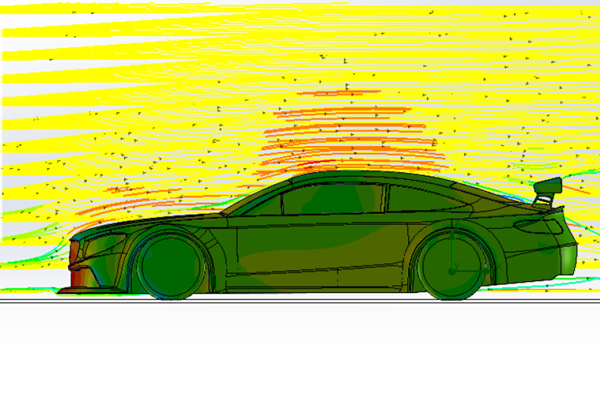 The work related to the CFD analyses involved both technical and design-related challenges. I relation to the continuous aerodynamical changes to the design, it is important that the final design aesthetically is a close match with the original cars, and that can be approved by representatives from DTC. 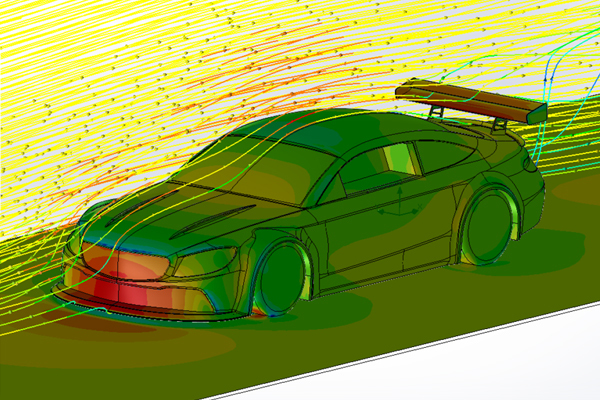 Moreover, the simulation of the Mercedes showed that it has low downforce and high drag force, compared to the Camaro. Several changes were tested, but the solution, which was suggested by representatives from DTC, was a “Gurney flap” on the back of the Mercedes, which increased its’ downforce without any particular increase in its’ drag force. After the new designs are approved and locked, the production base is created in 2D and 3D drawings. This process is described in the next article.